Combine salt, fennel seeds, chilli flakes and lemon rind in a snap-lock bag. Pound with a rolling pin until finely ground and fragrant. Set aside. Or you can use your pestle and mortar. Make Dressing Combine olive oil, vinegar and lemon juice in a bowl. Season with salt and pepper. Whisk to combine. Set aside. Heat pan. Drizzle cut side of peach and nectarine with 1 tablespoon olive oil. Sprinkle cut side with sugar. Season with salt and pepper. Cook, cut-side down, for 3 minutes or until caramelized. Turn. Cook for 1 minute or until heated through. Transfer to a plate. Cut each half in half. Set aside. Arrange rocket on a large plate. Tear each Bocconcini ball into 2 pieces. Top rocket with Bocconcini. 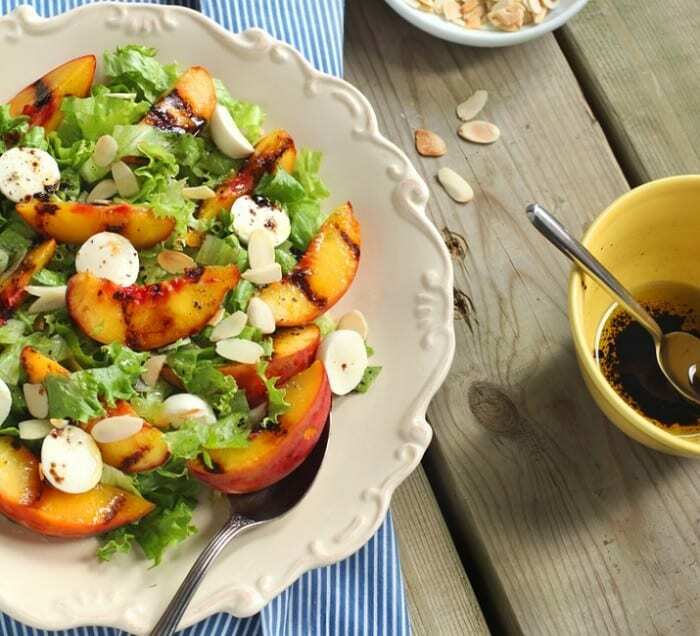 Top with peach and nectarine pieces. Season with pepper. Whisk dressing and drizzle over salad. Sprinkle with spice mixture.